Staff and riders at Willow Farm were thrilled when the announcement was made that we had reached the Horse & Hound shortlist for Riding Club of the Year. 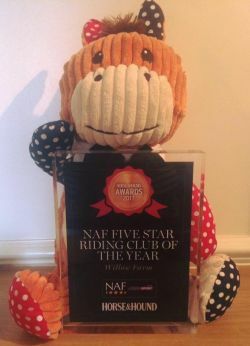 The NAF Five Star Riding Club of the Year award celebrates the organisations that bring riders together and best support them in achieving their goals – changing riders’ experiences for the better. The results of the online vote were announced during a gala dinner hosted by Horse & Hound at Ascot Racecourse on 2 November which was attended by the great and the good of the Equine world – and our own Lora Hawkins. To our great delight Willow Farm won and Lora was presented with the trophy by Jonty Evans, Team Ireland Olympic Eventer and NAF Ambassador. Watch the interview Lora gave to Horse & Hound. For information on Willow Farm and how to join ring 01754 830316 or contact us on Facebook. This entry was posted on November 12, 2017	and is filed under About us. You can follow any responses to this entry through the RSS 2.0 feed. Both comments and pings are currently closed.